सिंगूर नंदीग्रामच्या सेझ प्रश्नावर (नॅनो प्रकल्प) त्यांनी आंदोलन केले होते..
Medha Patkar (Birth: 1-December-1954) is the leader of the Narmada Rescue movement. Born in Mumbai, Medha Patkar's parents were socially and politically aware. His father had participated in the Indian independence movement. The mother was an activist of the organization sponsored by the questions of women named Tasmaar. 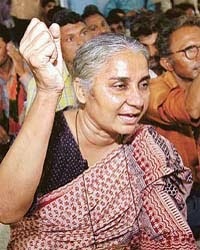 Medha Patkar's thoughts on the ideals of his parents were deeply affected. He passed MA from Tata Social Science Institute. Graduated. (TISS). After that, he has been working in various NGOs in Mumbai for seven years. He also worked for a short time as a teacher in the Tata Institute of Social Sciences. They had agitated on Singur Nandigram SEZ question (Nano project). He had opposed the anti-hunger strike organized by Raj Thackeray. In the 2014 Lok Sabha elections, he contested from Mumbai via Aam Aadmi Party.